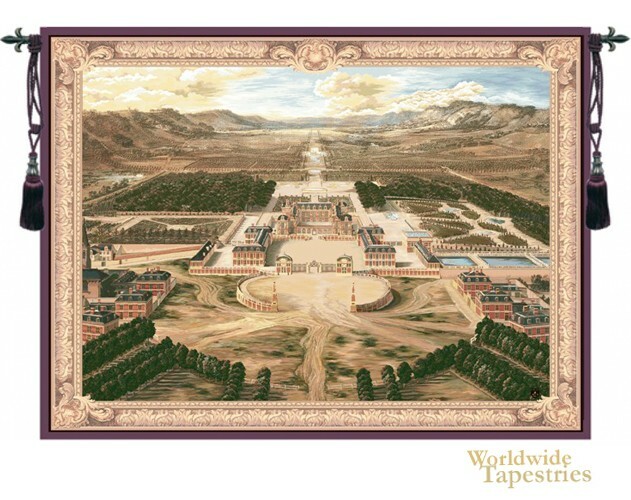 This tapestry shows the Chateau de Versailles, located southwest from the center of Paris on an stunning elevated plateau. The surrounding hills and woods nestles the palace and grounds which have been the home of the French royalty since the time of Louis the XIV in 1692. His court architect Le Vau, and landscape artist Le Notre, transformed the palace itself and the grounds to accommodate the royalty and has since been one of the most beautiful and history filled palaces in all of Europe. This tapestry shows the state of the grounds and palace in approximately the year 1668 before the enlargement of the chateau and the building of the Hall or Mirrors. It has been said that this chateau is an prime example of how architecture has been created to perfectly be in harmony and complement the equally beautiful grounds and natural landscape beyond. This is a grand and luscious tapestry which shows the beautiful grounds and chateaux of Versailles with historical accuracy and its incomparable glory. This tapestry is backed with a lining and has a tunnel for easy hanging. Note: tapestry rod and tassels, where pictured, are purchased separately.